All metal and powder coated Brake Rotor Covers. Easy to install. Get that race car look! 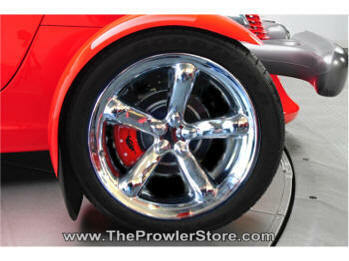 They are painted in standard Red (not designed to perfectly match any prowler body color). Bolt heads and Kat logo are recessed into the surface and painted to order. For custom colors see item below. Everything you need to mount them is included. What are our Caliper Covers? 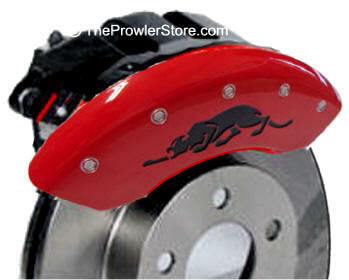 Brake Caliper Covers are a bolt-on stylish upgrade for your factory calipers. These easy to install covers reduce brake dust, decrease caliper heat, prolong the life of brake pads and hide unsightly rust. Be sure to check the fitment notes for specific model application below. What are the Fitment notes? Caliper covers require 1/8" clearance (equal to the thickness of two quarters) between the wheel and the brake caliper. Measure from the back of the wheel to the front of the caliper for clearance. 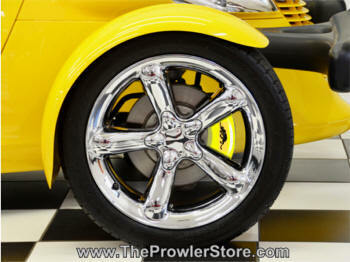 Be sure to check the clearance prior to purchase or contact us with any fitment questions. 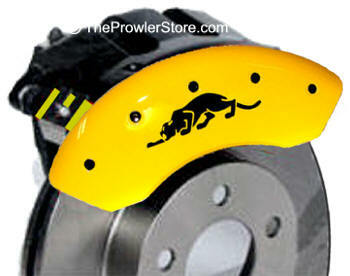 What are some quick points about your brake caliper covers? What are the Caliper covers made of? 6061-T6 Aerospace grade aluminum. 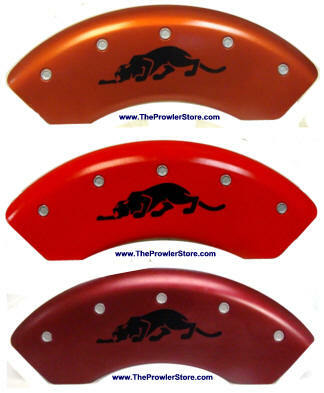 Proudly made in the USA, these caliper covers are hydraulically formed to fit OEM brake calipers, TIG welded for long lasting durability. How do I install these covers? 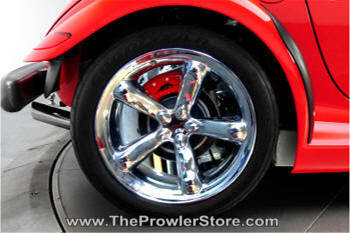 See our Fitment pictures for installation and read our detailed installation instructions. In short, Installation takes approximately 40 minutes to one hour. All you will need are a jack, safety jack stands, a lug wrench and 3/8" wrench and you will be on the road. No drilling, no grinding, no tape or adhesive, no paint, no cleaning and no messy prep work is necessary to install our caliper covers. Covers can be removed and reinstalled anytime. All metal and powder coated Brake Rotor Covers. Bolt heads and Kat logo are recessed into the surface and painted to order. For custom colors see item below. Easy to install. Get that race car look! These are professionally painted using the exact factory color paint. 3 layers of Clear coat over the top. Watch our installation video at the top of this page and read our detailed installation instructions online. In short, Installation takes approximately 40 minutes to one hour. All you will need are a jack, safety jack stands, a lug wrench and 3/8" wrench and you will be on the road. No drilling, no grinding, no tape or adhesive, no paint, no cleaning and no messy prep work is necessary to install our caliper covers. Covers can be removed and reinstalled anytime. 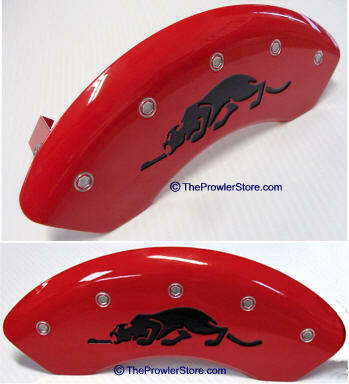 From top to bottom - Prowler Orange, Prowler Red, Prowler Candy Red, Prowler Mulholland Blue custom paint examples.